This page contains beef au' jus recipes. A roast dinner can be enhanced with addition of beef broth and seasonings for a thin gravy. Rub roast with garlic salt and pepper, liberally. Brown. Cover and cook slowly 2 hours. Slice meat thinly. Place onions in pan. Pour in soup and beef broth. Place meat in onion mixture, with bone on top. Simmer one hour or more until very tender. Cook beef, slowly, uncovered with water. Slice thin when roast is cooked. 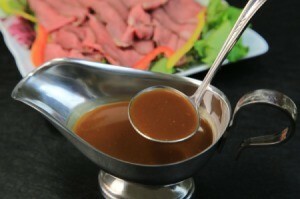 Take beef juices from roast, add package au jus and seasoning. Stir in, add some water. Place sliced beef in glass baking dish with juices. Cover. This can be placed in oven and warmed up for serving or can be warmed up the next day, low temperature.